Here’s a good deal if you are looking for a new optic for your hunting or match rifle. For the next month, April 15 through May 15, 2018, Zeiss is running a great promotion on its latest Conquest V4 optics line. The Zeiss annual “Tax Refund Days” promotion cover the entire Conquest V4 family of riflescopes. These are 1-4x24mm, 3-12x56mm, 4-16x44mm, and 6-24×50 models, which range from $799.99 – $1199.99 MSRP. Purchase any of these Conquest V4s and receive a $100.00 immediate in-store accessory credit at time of purchase. Take advantage of this promotion through participating Zeiss Authorized Sports Optics retailers throughout the United States. This applies to online purchases as well — you just apply the $100.00 credit to other products the online seller offers. “The Conquest V4 riflescopes are getting lots of attention and praise” says Barton Dobbs, Director of Sales for Carl Zeiss SBE, LLC Sports Optics. “We listened to our customers as to what they want and demand from a scope in this price category, and we enjoy hearing how much these customers like the modern features and the high level of performance the V4’s provide.” NOTE: Quantities are limited. To locate a participating retailer, or to find out more about Zeiss products, visit Zeiss Sports Optics. The scopes are lighter than expected, considering they have a 30mm tube and are very robust. The optical performance is outstanding, and compares directly with the Zeiss Victory products, and indeed the Conquest V4/V6 products utilize the same coatings. Users report that … the V4 glass is clearer and brighter than Nightforce SHV/NXS products. Share the post "Zeiss Offers “Tax Refund Days” Promo on Conquest V4 Scopes"
Carl Zeiss Sports Optics has introduced a new 85mm spotting scope, the Conquest Gavia 85. This new 30-60X spotter is a modern, shorter and lighter design that may challenge Kowa’s category-leading 88mm Prominar spotter, at a more attractive price. The Zeiss Gavia 85’s MSRP is $1999.99. You can pay $2100.00+ for the Kowa 88mm Prominar angled BODY ONLY. Kowa’s 25-60X Prominar LER Eyepiece runs another $569.00, so total cost approaches $2700.00 for the Kowa system. The new Conquest Gavia 85 angled spotting scope combines 60X max magnification with a wide-angle field of view. A large center ring allows fast, positive focusing. Zeiss claims the large 85mm objective and low-dispersion HD glass provides “outstanding optical performance and brightness” plus great low-light performance. For a spotting scope with a large 85mm objective, the Zeiss Gavia 85 is lighter than expected. With 30-60X removable eyepiece, this spotter weighs in at 60 ounces (3.75 lbs. or 1.7 kg). The spotter is fogproof and waterproof, with LotuTec® lens coatings for easy cleaning and good clarity in all types of weather. Weight (incl. Eyepiece): 60 oz. For more information on the Zeiss Gavia 85 spotting scope and other Zeiss products, visit www.Zeiss.com or the Zeiss Facebook Page. Optics Product Tip from EdLongrange. We welcome reader submissions. Share the post "New Zeiss Conquest Gavia 85 Spotting Scope Looks Good"
Looking for a very high-quality hunting scope that won’t break the bank? The German-crafted Zeiss Conquest DL has won many awards, yet it’s half the cost of super-premium European brands. For general performance, durability, and glass quality, many experts say the Conquest DL sets the “benchmark” for the “upper middle” end of riflescopes. Here is a very revealing review of the Conquest DL by British lady hunter Ginny Langton. In a recent comparison review, gunwriter L.P. Brezny rated the 3-12x50mm Zeiss Conquest DL one of the best hunting scopes under $1000. Brezny states: “As a second option on my list of five top hunting scopes for big game that are under a grand stands the Zeiss Conquest DL Hunting Scope in 3x12x50mm. Here you have an illuminated reticle [extra cost], ultra-refined German glass, and a side focus knob with the Z-Plex reticle. In most cases what is in this optic, in terms of quality, is often found at a much higher price.” This German-made Conquest DL retails for $999.99 on Amazon.com (non-illuminated) or $1299.95 with illuminated reticle. The entire Zeiss riflescope line is available from Europtic.com. Call (570) 368-3920 and ask for Jason Baney and request the best price. Tell Jason that AccurateShooter.com sent you. Share the post "Zeiss Conquest DL Hunting Scope — Leader in its Price Range"
Scores of manufacturers showcase their products at the SHOT Media Day event, held each year in Boulder City, Nevada. This year we saw some legendary names (such as Colt and Winchester), as well as new, 21st-century gun-makers (such as Tracking Point). Savage and Kimber had some surprising new offerings, and we saw impressive new optics from Zeiss and Minox. There were some interesting trends. Many firearms were equipped with “factory” suppressors. 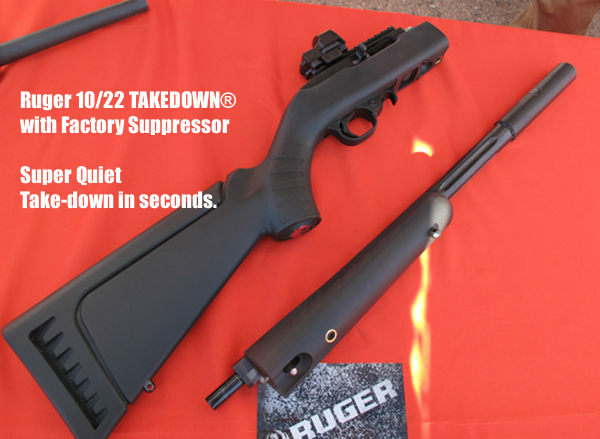 Ruger, much to our surprise, showcased a Ruger 10/22 takedown rifle fitted with a Ruger-branded suppressor. It was extremely quiet. Many of the handgun manufacturers, including Ruger and Walther, supplied ammunition with composite polymer matrix bullets. These bullets are significantly lighter than conventional pistol bullets of the same caliber (the reduced bullet mass did lessen felt recoil with 9mm and 45 acp pistols). The polymer bullets are lead-free, and they don’t ricochet, so they are both more “eco-friendly” and safer when used on steel targets. Savage unveiled a modern, “monolithic” metal-chassis tactical rifle. Designed to compete with the Ruger Precision Rifle (RPR), the new Savage 110 BA Stealth has an AR-type hand grip, skeletal buttstock, and a low-profile vented forearm. This rifle will be offered in .308 Winchester and 6.5 Creedmoor while a slightly bigger model will be offered in .300 Win Mag and .338 Lapua Magnum. Savage says that all the 110 BA Stealth models will feature “factory blue-printed actions” for improved accuracy. MSRP varies from $1200 to $1600 depending on caliber and configuration. It should be available starting next month. The model on display, chambered in .308 Winchester, proved accurate in the hands of Ed M. of 65guys.com. Ed liked the trigger and the fact that the rifle uses PMags. The stock, based on a design by Drake Associates, is very light but also very rigid. Ed thought this stock would work well on barricades in tactical matches. Steve L. of 65guys.com said there is “pent-up demand” for a rifle like this, and he predicts the 110 BA Stealth will be a big seller for Savage. Kimber, known for its 1911-type semi-auto pistols, has introduced an all-new K6 .357 magnum carry revolver. 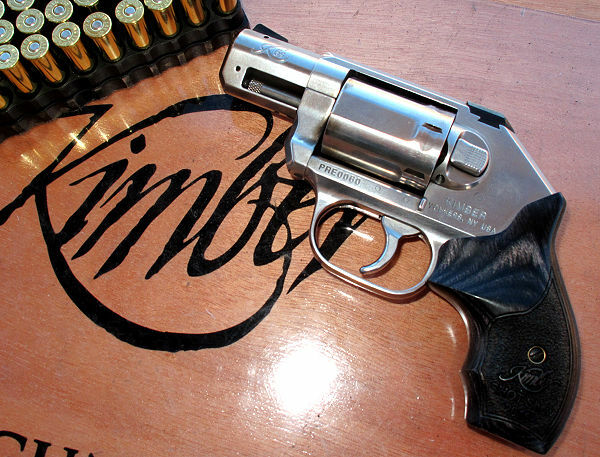 Kimber’s hammerless wheelgun was very nicely crafted and had one of the smoothest double-action pulls we’ve tried. The trigger pull was long, but very consistent and smooth. With the Kimber, you don’t feel a series of “stages” or transitions as you do with most other double-action revolvers. The other impressive thing about the new revolver is the finish — the stainless is very smooth and shiny, the result of “much hand polishing” according to Kimber engineers. The most fun we had all day was at the Ruger booth. 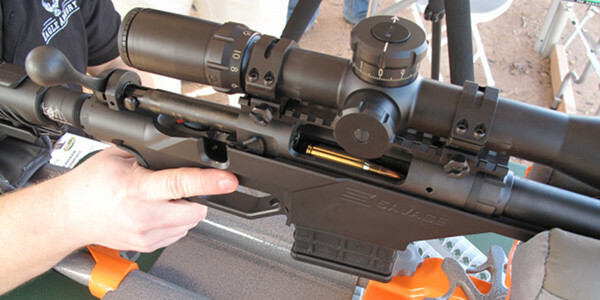 There we got to test a Ruger 10/22 Takedown fitted with a Ruger-branded factory-made suppressor. This little rifle was a hoot to shoot, and with the suppressor in place it was amazingly quiet. We really liked this set-up and the take-down system worked brilliantly — just pull one lever, then twist and the barrel section comes off. For those states where you can own a suppressor, we strongly recommend this configuration. The “can” is sold separately and buyer must still comply with all applicable state and Federal laws. Zeiss showed off its impressive Victory V8 line of riflescopes. These offer an 8X zoom ratio, with handy BDC turrets — just dial the yardage indicated on the turret (you can custom-order BDC rings calibrated for your favorite load). 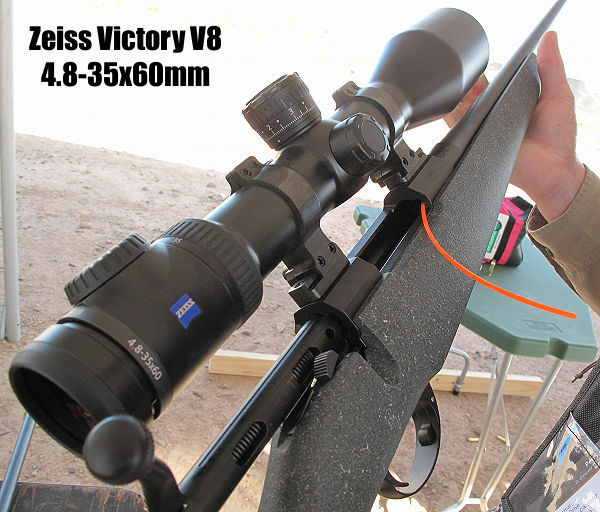 The new V8 scopes offer many impressive features. 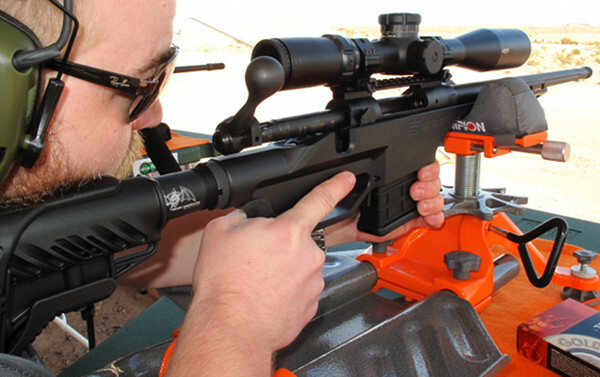 We shot a rifle fitted with the new 4.8-35x60mm V8, which features a very beefy 36mm main tube. The glass was bright and ultra-sharp. Zeiss claims 92% light transmission. Fiber optic technology provides a very precise red dot in the center of the reticle. This was visible even in bright sunlight. Zeiss will offer three other V8 models: 1-8x30mm, 1.8-14x50mm, and 2.8-20x56mm. Bigger is apparently better when it comes to serious tactical rifles. 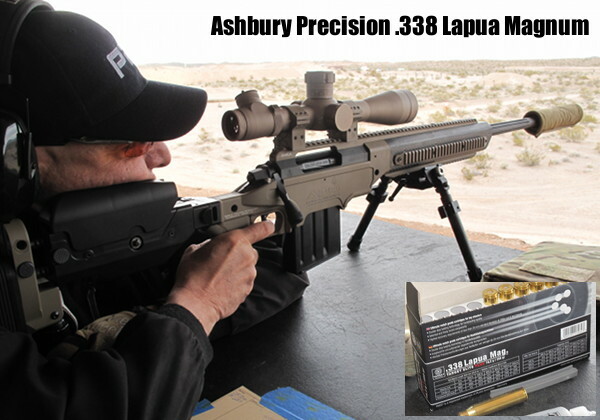 There were quite a few rifles chambered for the powerful .338 Lapua Magnum Cartridge. 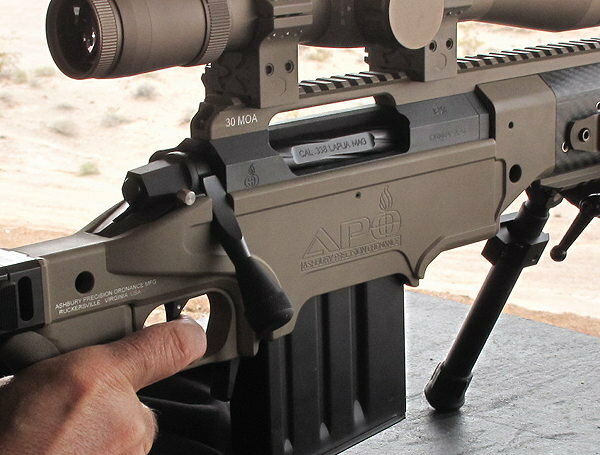 We tried out a .338 LM from Ashbury Precision Ordnance. With some help from a laser rangefinders, we were able to put rounds on a large steel plate at 960 yards. The trigger was nice and the suppressor reduced felt recoil. This was a nice rifle, with a comfortable cheek-piece and ergonomic grip. 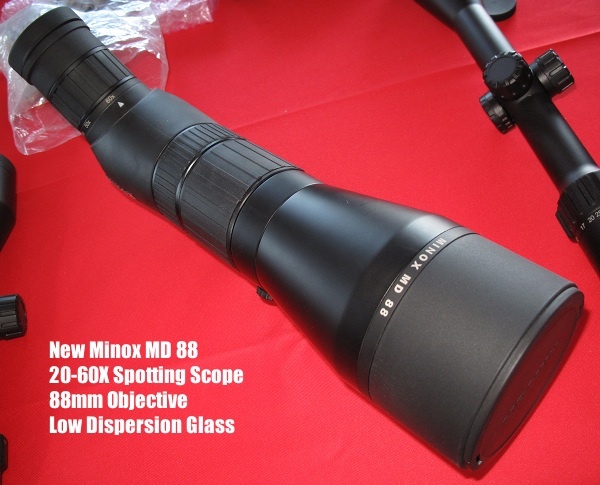 We noticed a BIG front objective on a brand-new Minox spotting scope — one of only two in the country. This new spotter features low-dispersion glass and dual focusing rings — a large “fast focus” ring and a second smaller, fine focus ring. The price, including 20-60X eyepiece, will be around $1750.00. Jason Baney, who works for EuroOptics, says this new Minox spotting scope compares well with other spotters that cost considerably more. If there was one rifle I wanted to take home with me, it was this nice Blaser R8 “Professional Success” model with a fancy wood new thumbhole stock. This rifle was very comfortable in all shooting positions. The gun balanced well and the straight-pull Blaser action is fun to use. It can be cycled rapidly without disturbing your position on the rifle. This is always something new and unusual on display at Media Day at the range. 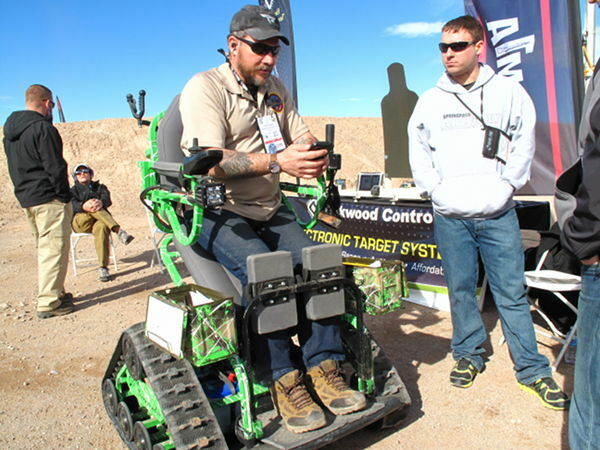 This tracked one-man rig provides all-terrain mobility so disabled persons can enjoy hunting and wilderness recreation. Share the post "Media Day at the Range 2016"
We all know Zeiss makes good optics, and now you can save $50-$150 on Zeiss binoculars or Zeiss riflescopes. As part of the Zeiss Summer Field Days promotion, Zeiss is offering $50.00 cash back on select scopes and binoculars (and $150.00 on the Victory HD binos). Hunters may want to take advantage of this offer for the CONQUEST HD5, and Victory HT Scopes with RAPID-Z ballistic reticles. Those are nice optics. To claim the rebate, purchase eligible products between 7/1 and 8/31/2015 at any participating ZEISS Authorized Dealer, then visit the Zeiss Online Rebate Center to register your rebate. Be sure to save your product receipts. Share the post "Zeiss Summer Field Days Optics Rebates"
When does a scope cost as much as a new Harley-Davidson? When it is a top-of-the-line 72mm Hensoldt (by Zeiss). The remarkable Hensoldt ZF 6-24x72mm SAM scope integrates ultra-bright apochromatic fluorite glass with a calculator module that provides ballistic info and weather data to the shooter. This 6-24x72mm SAM Hensoldt may be the most advanced riflescope on the planet. With a street price of $11,982.00, it is certainly one of the most expensive. Take a 360° tour with this cool video from Hensoldt Zeiss. SAM stands for “Sniper Auxiliary Module”. An integrated ballistics calculator can be programmed for up to four different types of ammo. Sensors in the integrated ring mount measure weather parameters. These values, as well as scope data, are then directly projected into the visual field of the eyepiece. This provides selectable displays of elevation clicks, windage clicks, angle of fire, cant angle, temperature, and air pressure. Share the post "World’s Most Expensive Scope? $12K Hensoldt 6-24x72mm SAM"
Hunting season is right around the corner. If you don’t own a worthy deer-hunting rig, there are many affordable options available. You can often save yourself $100.00 or more by purchasing a “turn-key” deer rifle package — a hunting rifle combo complete with rings and rifle-scope. The American Hunter magazine website recently published a guide to affordable package hunting rigs. Jon Draper spotlights Four Off-The-Rack Deer Rifle Combos from Howa, Mossberg, Ruger, and Savage. Two of the four rigs, the Mossberg and Savage entries, come in at under $500 including scope/rings. Next up is the Ruger American Rifle, priced at $679.00 MSRP with 3-9x40mm Redfield Revolution scope. 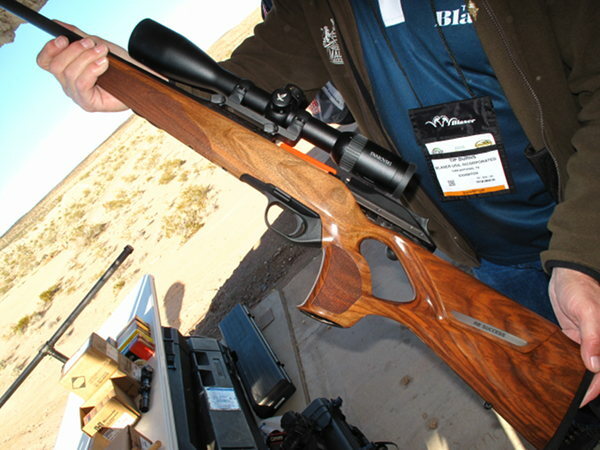 The priciest entry is Howa’s Hunter Zeiss Walnut Package. MSRP is a not insubtantial $1103.00 for the Howa package, but this includes a premium-quality Zeiss Terra 3-9x42mm optic. The Howa also has a very nice two-stage 2.5 to 3.8-lb HACT trigger* that we prefer to the triggers on the other three, lesser-priced rifles. To learn more, CLICK HERE to read the American Hunter Deer Rifle Combo article. * HACT stands for Howa Actuator Controlled Trigger. Howa’s HACT assembly is a trigger and sear unit that works like a two-stage trigger. This allows the shooter to take up trigger creep before squeezing through. HACT trigger pull weight adjusts from 2.5 to 3.8 pounds. We like the lower weight for varmint rifles shot from prone or portable benches, while we prefer the heavier pull weight for a carry rifle. Share the post "For Hunters — Four Deer Rifle Combos Starting at $485.00"
Father’s Day (Sunday, June 15) is right around the corner. If dad enjoys hunting, here’s a way to save fifty bucks on a nice gift for the old man. Now through June 15, 2014, Zeiss is offering a $50.00 rebate on the TERRA 3X series rifle-scopes or TERRA ED Binoculars. 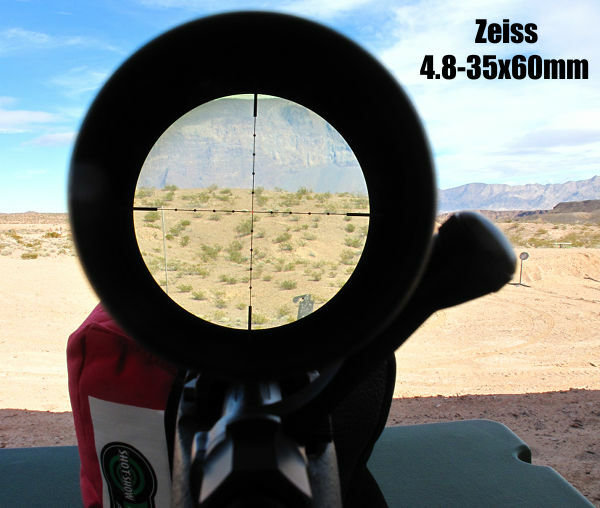 The scopes offer 1/4-MOA clicks with a choice of standard Z-Plex or RZ6 or RZ8 ballistic reticles. Pick your power: 2-7x32mm, 3-9x42mm, 4-12x42mm, 3-9x50mm, and 4-12x50mm. CLICK Here for more details. If you’re wondering about these binoculars, trust us, they are high quality. TERRA ED Binoculars feature SCHOTT ED glass — just about the best you can get. These binocs, in 8x42mm or 10x42mm versions, offer great low-light performance and a wide-angle field of view. Share the post "Save Fifty Bucks on Zeiss TERRA Scopes or Binoculars"
Carl Zeiss Sports Optics has some very attractive promotions in place right now — with rebates from $50 to $500.00. With Zeiss Field Days mail-in rebates you can save money on premium rifle scopes, spotting scopes, laser rangefinders, and rangefinding binoculars. But time’s running out. The 2012 Carl Zeiss Field Days Promotion runs out on December 31, 2012. CLICK HERE for Field Days Rebate Coupon. Zeiss produces a very high-quality spotting scope. We did a three-way test with a Pentax PF-100ED, 2010-model (one piece) Swarovski 80mm, and 2012 Zeiss 85mm Diascope. Compared to the big Pentax, the Zeiss could resolve very fine lines better and the Zeiss had less chromatic aberration. The Diascope was very, very close to the Swaro in resolution, but it had a slight edge in low light given its larger front objective. Most of our testers gave a slight edge to the Swaro for contrast. The dual-rate focus system on the Zeiss does take a while to master, but it allows faster focusing than either the Pentax (which uses two separate knobs for course and fine focus), or the Swaro (which has one large full-diameter focusing ring). If you’re choosing between the Swaro and the Zeiss, the $500.00 rebate can easily settle the argument. Street price for the Zeiss Angled 85mm Diascope (before rebate) is $2999.99 including Vario 20-60x Eyepiece. Do note, however, that anyone considering a high-end spotting scope should also look at the Kowa 88mm TSN-88X Prominar HD series ($2310.00 street price for TSN-883 Angled, BODY ONLY). All purchases must be made from a Carl Zeiss Authorized Dealer in the United States and rebate request forms must be completed and postmarked within 30 days of purchase. Payment will be made by a ZEISS Prepaid Reward Card by American Express. For promotion details, visit the Field Days Promo Page. For faster payment and real-time tracking, register on-line at Zeiss.4myrebate.com. After submitting your rebate forms, check the status of your rebate with the Zeiss Online Rebate Tracker. $500 rebate on the 65mm and 85mm VICTORY DiaScope (plus free tripod). $300 rebate on the award-winning VICTORY RF rangefinding binoculars. $50 rebate on the award-winning VICTORY 8×26 PRF laser rangefinding monocular. $100 rebate on the NEW Conquest HD 42mm binoculars. $100 rebate on the NEW Conquest 30mm Duralyt Riflescopes. $100 rebate on all riflescopes that have any Rapid-Z reticle. Share the post "Ten Days Left for Zeiss Rebates on Optics and Rangefinders"
In our articles collection, you’ll find a story of interest to varminters and game hunters. Choosing And Using Modern Reticles, by author John Barsness, reviews the many “hold-over” reticle options currently available for hunting scopes. The latest “hunting hold-over” reticles, such as Leupold’s Varmint Hunter Reticle, offer both vertical marks (for hold-over) and horizontal bars or dots (for wind compensation). The idea is to allow the shooter to move quickly from one target distance to another, without having to dial elevation changes with his scope turrets. Likewise, the horizontal wind-hold markings give the shooter reference points for winds of specific velocities. That makes the process of “holding-off” for wind much more predictable. In the Barsness article, which originally appeared in Varmint Hunter Magazine, the author traces the history of ranging/hold-over reticles starting with the Mildot reticle. Barsness explains how to use the mildot reticle, noting how it is best used with a First Focal Plane scope design. If nothing else, you’ll want to read this article just to improve your understanding of First Focal Plane (FFP) vs. Second Focal Plane (SFP) optics operation. If you want to use the markings on a reticle to range at various magnification levels, then you want the FFP design, preferred by the military. If, on the other hand, you prefer the viewed appearance of your reticle to stay constant at all power levels, then you’ll probably prefer the SFP design. Barsness explains how the modern “Christmas Tree” design reticles, such as the Zeiss Rapid Z, evolved, and he explains how to use these reticles to adjust your point of aim for different target distances. These hold-over reticles can be very handy, but you must remember that the yardages which correspond to the stepped vertical markings are determined by the ballistics of your cartridge. Thus, if you change your cartridge, or even change your load significantly, your hold-over yardage values will change. You will then need to field-test to find the actual value of the reticle’s hold-over points. These days there are reticles with everything from a few extra dots along the vertical cross hair to reticles that cover the bottom third of the scope’s field of view, providing an aiming point for every blade of grass in North Dakota. Here we run into the basic fact that simpler reticles are easier to use, if not quite so versatile. Personally, I particularly like simple reticles in shorter-range varmint rifles, whether rimfires or small centerfires such as the 22 Hornet. 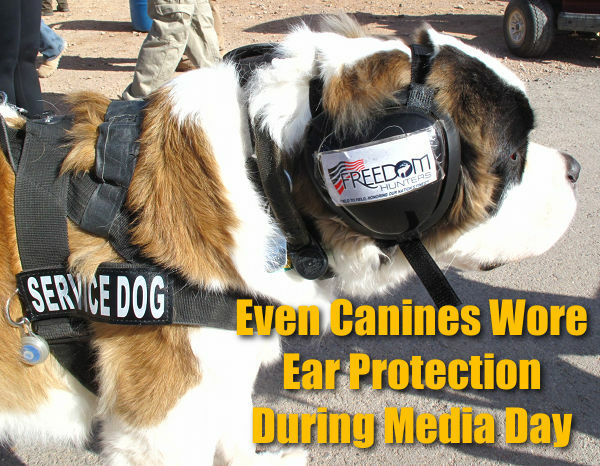 These aren’t likely to be used at extended ranges, or in any significant amount of wind. Hence, something like the Burris Ballistic Plex reticle provides about all the information we can realistically use — the reason there are Burris Ballistic Plex scopes on most of my rimfire or small centerfire varmint rifles. CLICK HERE to Read ‘Choosing and Using Modern Reticles’, by John Barsness. Share the post "Feature Story on Varmint and Hold-Over Reticles"
Carl Zeiss Sports Optics has just announced its latest FIELD DAYS promotion. From August 1, 2012 through December 31, 2012, Zeiss is offering consumers significant savings on many of its most popular optics. With FIELD DAYS mail-in rebates you can save money on rifle scopes, spotting scopes, laser rangefinders, and rangefinding binoculars. purchase a DiaScope will also receive a free, portable tripod. All purchases must be made from a Carl Zeiss Authorized Dealer in the United States and rebate request forms must be completed and postmarked within 30 days of purchase. Payment will be made by a ZEISS Prepaid Reward Card by American Express. For promotion details, visit www.zeiss.com/sports and click the “Promotions” link on the left. Then click the Field Days Promotion Link. For more information, call 800-441-3005. Share the post "Zeiss Announces 2012 FIELD DAYS Promotion"